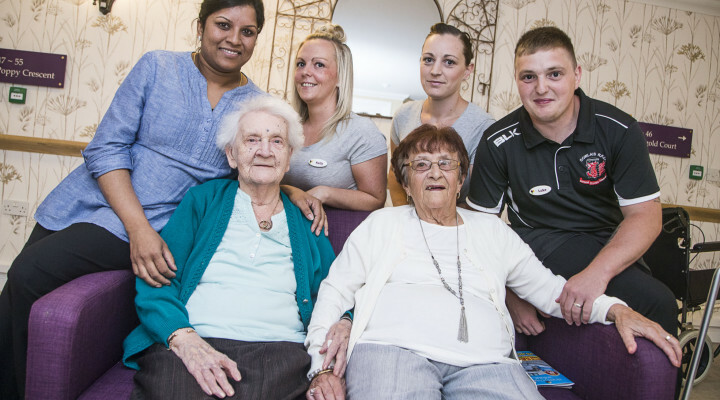 FOUR dedicated workers from a Merthyr Tydfil care home are in the running for national awards, known as the ‘Oscars’ of their industry. Sreeja Ranjith, 36, a nurse, Patricia Brown, 32, community manager, Luke Jenkins, 27, activities coordinator, and Kelly Collard, 35, a senior carer, all based at Greenhill Manor Care Home in Pentrebach, will be at the 2016 Wales Care Awards ceremony on Friday October 21. The awards, run by Care Forum Wales, will be held at City Hall in Cardiff. Sreeja Ranjith, 36, often spends time on her days off taking residents out for meals or on shopping trips and also brings in her young son to cheer them up. Sreeja, who is shortlisted in the Nurse of the Year category sponsored by Ontex UK, is originally from Bangalore in India and came to the UK in 2004. Sreeja has been married to husband Sai Ranjith, who is also 36, for the past eight years and the couple has a son, Ankith, who will be two this October. Sreeja said: “I like to do things to make people’s lives a little nicer, which is why I take my son into see them. Sreeja added: “I love my job and do things like this to keep the residents happy. I also try to stay as cheerful as possible as that helps them. Also thrilled to be nominated is Patricia Brown, who has been shortlisted to receive an honour in the commitment to training and workforce development category, sponsored by Pendine Park Academy. As well as being a hands-on community manager carrying out person to person care, Patricia is tasked as a manual handling trainer for Greenhill Manor Care Home, and has also assisted at a number of homes with the region. She first learned to be a manual handling trainer in 2007 and since then refined her training techniques and delivery to constantly improve both her own skills set and that of others. She also trains colleagues in safe use of bedrails and emergency fire evacuation procedures. The mum-of-three said: “It can be challenging work, but it is important to be flexible and supportive to all our staff and to be able to adapt our skills to accommodate the needs of each individual resident. Former rugby player Luke has been nominated in the Promoting Fulfilled Lives award, sponsored by Boots. The final member of the Greenhill team to be at the ceremony on Friday is Kelly Collard who was nominated by the home’s general manager Mark McCole and there were additional glowing testimonials from other colleagues and relatives of people in her care. Praising her professionalism, high standards and enthusiasm, Mark wrote: “She never fails to share information, build relationships, engage and communicate, and show empathy, compassion and respect whenever necessary. Kelly said she was “gobsmacked” to have been shortlisted for such a prestigious award and for doing what she enjoyed. “I like to think I am brightening up someone’s life and when I get a smile back I am happy,” she said.